Is this not the cutest??? When I saw this photo, I was inspired by those cute little animals! 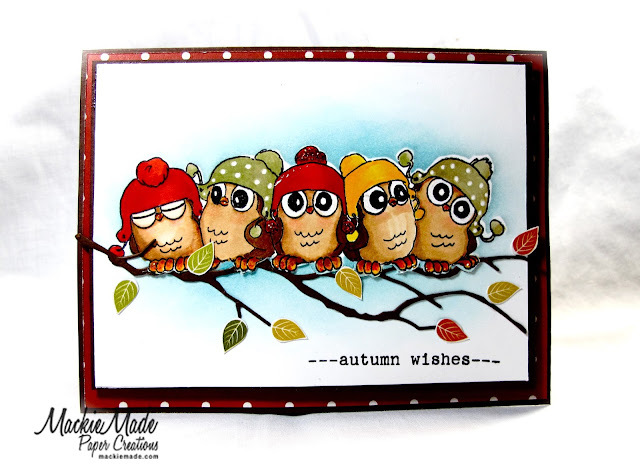 So, I immediately thought of this adorable stamp by Art Impressions called Five Whoots! I just love their big eyes! I made this card by first stamping the image onto white card stock and then stamping it again on a post-it note to create a mask. I placed the mask on top of the stamped image and sponged around it with Tumbled Glass Distress ink to create a sky background. Next, I colored the owls with Copic Markers. I added some black Wink of Stella to their eyes to make them pop! The branch that they are sitting on is a Memory Box die that I have in my stash. I carefully cut around the owls little claws with an Exacto knife, so that I could push the branch up underneath them. I wanted their little feet to look like they were holding on to the tree branch!The little leaves were fussy cut from a dp that I got from the Perfect Autumn(Carta Bella) 6X6 paper pad. 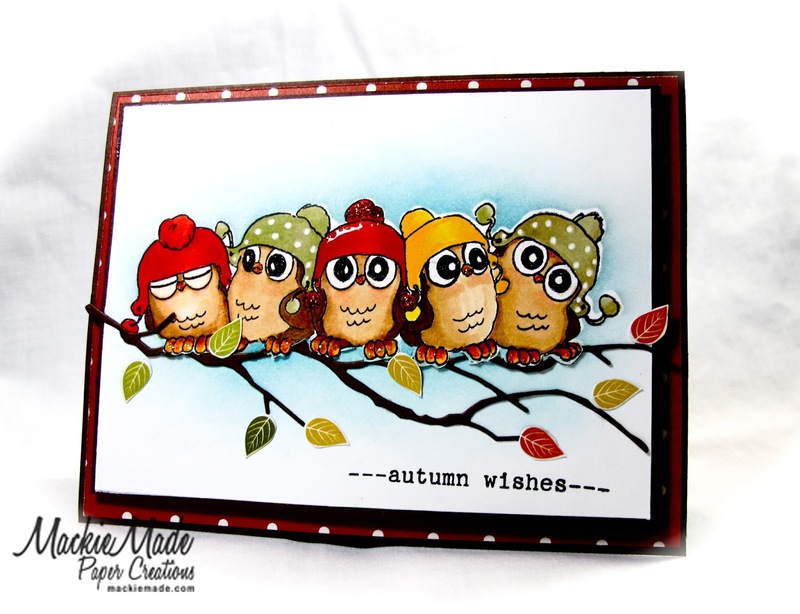 The little owls look like they are enjoying a nice fall day! We sure do hope you will join us HERE at the The Card Concept! Remember , they're many different styles to choose to create. 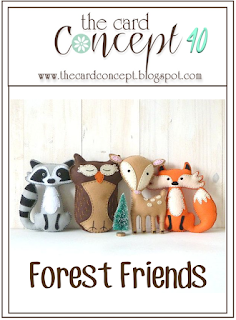 You will see the different styles if you visit my Card Concept Teamies! So much talent! You will truly be inspired! Super CUTE with all the adorable owls...love their eyes!!! such amazing colouring and masking. 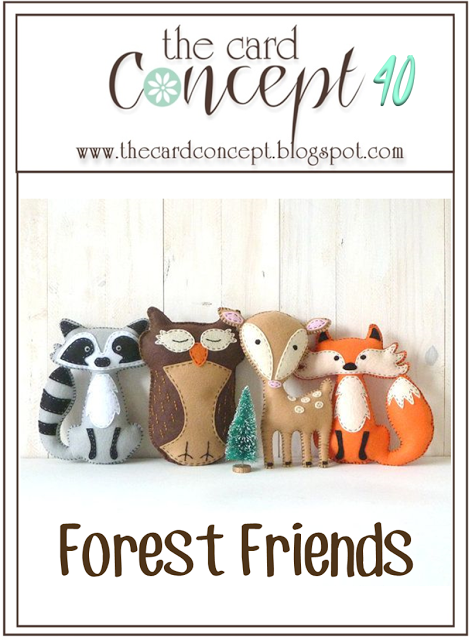 I spotted the blue shading around the critters first off and loved it..now I know how you did it-love it! This is wonderful, love their little woolly hats! Awww such cuties! Awesome coloring too! Well aren't they a fun bunch!! This is so stinkin' cute Mackie and I just love their little hats!! This is so sweet! Love how you perched them on the branch! And the eyes are awesome!!! Awesome coloring Mackie, love it! Beautiful card! I just love the colors, and the birds on the branch are adorable! So much fun being on The Card Concept with you! Super fantastic! Love the little line of owls! OMG, those owls are soooooo stinking cute!! Your coloring is fantastic!!! I agree with the others- your owls are adorable!! 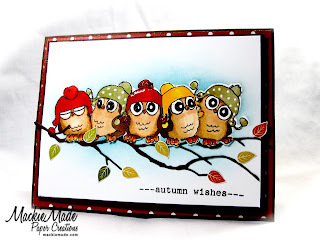 SUPER cute card love the AI owls! Wow, this card is just too adorable!! Love those sweet little owls!